eBay, however straight-forward it may seem, has a bunch properties and subsidiaries unknown to a majority of its U.S. users. Today, they announced the launch of Kijiji in the U.S mark, which has been one of their plays in the international free classified ads space, particularly Europe and Asia since 2005. In contrast to Craigslist, Kijiji supports a fairly modern, advanced, and Flash-based interfaced. 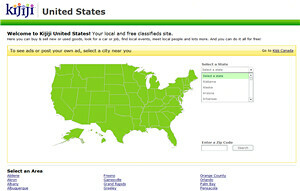 Since the service is local-centric, users are provided with a map of the U.S., a zip-code search, and a state/city selector (as compared to Craigslist’s city “list”). Upon selecting their town/city, they’re taken to what resembles a Web 2.0 version of the eBay homepage — a slick layout with with a whole bunch of categories and subcategories (mostly the ones you find in traditional classified listings), an events calendar, and a search feature. From here, Kijiji isn’t much different from any other online classifieds service. You can go ahead and post an ad (for free)or browse through the many listings present. Compared to Craigslist, the interface is a bit nicer to the eyes and provides a modern feel, although, there’s nothing like the classic Craigslist feel we’ve come to love. Ever since the early days of the dotcom boom, eBay and Craigslist have been compared as two completely opposite rivals which somewhat step in each other’s circle. While eBay has had a commercial, growing approach to letting users buy and sell stuff, Craigslist has been conservative, classic, local, and simple, focusing on classifieds and just that. 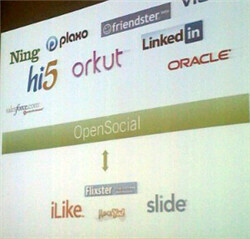 Kijiji builds on this and brings the eBay approach right into the middle of Craigslist’s arena. While the service might seem superior and advanced with a lot more bells attached, nothing comes close to the branding and image Craigslist has built in its decade of existence. Will Kijiji be able to even come close?